Atlas Pro Audio Questions About This Item? Brand New - Rupert Neve Designs Portico. Mic Pre and Instrument Amplifier. The 517s mic pre based on the TEC Award-winning Portico 5017 provides up to 66dB of gain, polarity-reverse and phantom power switches, and the Silk circuit for a more vintage vibe. The separate instrument amplifier includes 30dB of gain, a ground lift, variable phase and an instrument Thru connection. Used as a single channel device for instruments, the 517 can be used to phase align, combine and compress direct and amplified signals. To achieve this, use the DI for the instruments direct signal and the mic preamp for the speaker cabinet signal. The blend control is used for mixing direct and amplified signals to achieve the desired tonal blend between the two sources, and the variphase is used to minimize or extenuate phase cancellations between the two signals. To compress the blended signal, the internal compressor jumper must be set to the blend path (this is the default setting). This technique could also be used to create a single, mixed output of a guitar and vocals. Based around a new LDR (light dependent resister) design, the 517s opto-coupler compressor has been simplified to a single threshold control with auto make up gain. By default, the compressor is set to a fixed 2:1 ratio with fixed attack and release. To set the compressor, simply dial the threshold control down until the desired amount of compression is achieved. An LED light indicates when the compressor is active. In addition to the standard polarity reverse, the 517s vari-phase control may be used to adjust phase incrementally. This control is useful any time two signals derived from the same source are combined. For instance, even with careful placement, the combination of close miced drums and overheads, can often yield hollow-sounding results. By using the variable phase adjust, the direct signal can be phase rotated until the signals are naturally aligned. This technique is also extremely useful when combined with the internal blend control on instruments. A bassist or guitarist using both direct and micd signals can blend the two into a single output, using the variable phase to reach an optimal alignment. By adjusting the phase in the 517, the musician or engineer can find the absolute best mic position without regard to the phase relation to the direct signal. 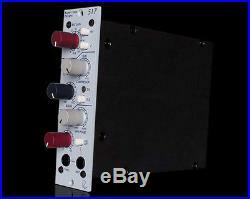 Rupert Neve Designs makes excellent gear at affordable prices. A legend in the industry. At Atlas Pro Audio it is our priority to have great customer service. We are dealers for over 80 lines of the best high-end pro audio gear available. Unauthorized reproduction is prohibited by law, subject to criminal prosecution. 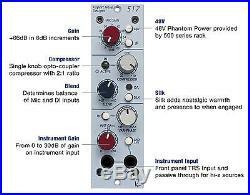 The item "Rupert Neve Designs Portico 517 Mic Pre/DI/Comp + Free Panel Atlas Pro Audio" is in sale since Friday, August 29, 2014. This item is in the category "Musical Instruments & Gear\Pro Audio Equipment\Preamps & Channel Strips". The seller is "www-atlasproaudio-com" and is located in Brandon, Florida. This item can be shipped to United States, Canada, United Kingdom, Denmark, Romania, Slovakia, Bulgaria, Czech republic, Finland, Hungary, Latvia, Lithuania, Malta, Estonia, Australia, Greece, Portugal, Cyprus, Slovenia, Japan, China, Sweden, South Korea, Indonesia, Taiwan, South africa, Thailand, Belgium, France, Hong Kong, Ireland, Netherlands, Poland, Spain, Italy, Germany, Austria, Russian federation, Israel, Mexico, New Zealand, Singapore, Switzerland, Norway, Saudi arabia, Ukraine, United arab emirates, Qatar, Kuwait, Bahrain, Croatia, Malaysia, Brazil, Chile, Colombia, Costa rica, Panama, Trinidad and tobago.